There’s no way to be 100% sure about my numbers, but they certainly imply that Amazon has been making the biggest possible deal out of its total number ever since that “tens of millions” comment at the end of 2013 (which referred to 21 million subscribers according to my estimate). These numbers would also help explain why Amazon didn’t provide a percentage growth number at the end of 2016 as it did in the previous two years: the percentage likely went down, again as a result of an increasingly large base, not lower subscriber growth – it added 20 million subs in 2016 versus 17 million in 2015. One other interesting wrinkle which I’ve wondered about for a long time is the way Amazon allocates revenue between the components of its Prime service, which after all combines free two day shipping with a Netflix-like video subscription and various other benefits. Its financial reporting has always made clear that it allocates these portions of revenue to different buckets – specifically, its Net Product Sales and Net Service Sales categories – even though they all come from the same Prime subscriptions. Understanding this split may seem of purely academic interest, but in fact it’s key to divining the economics of Amazon’s Prime video business. One interesting thing about the new grouping of revenues Amazon provided in its 10-K is that there is just one portion of revenue allocated differently here from in Amazon’s other reporting, and that’s the shipping component of Prime revenues. In the Net Product/Service Sales split, shipping goes into Product, whereas in the Similar Products split it goes into retail subscriptions. Therefore, if we look at the differences between the amounts reported in the various segments, we can deduce the Prime shipping component, and by implication the portion allocated to everything else (mostly video). What you can see is that the revenue allocation is shifting quite significantly over time from shipping towards the rest – shipping was 63% or almost two thirds of the total in 2014, but only 56% of the total in 2016, and the actual numbers have both risen considerably. 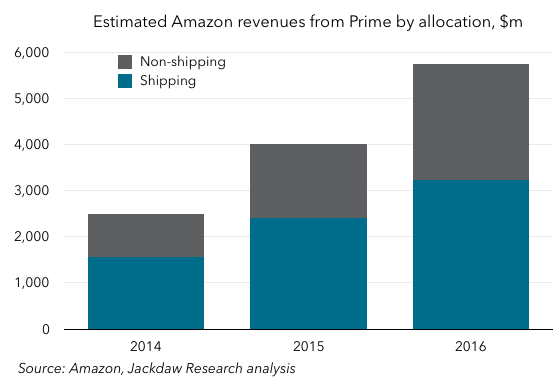 For comparison’s sake, the Prime shipping allocation is around a third of Amazon’s total shipping revenue. In other words, Amazon increasingly focuses on the cross-category aspect of the Amazon Prime bundle. ​Amazon Prime is immensly important. At the same time its importance (regarding revenues and costs) to Amazon equals a rising risk strategically. For now, Amazon Prime remains an ingenious construct.